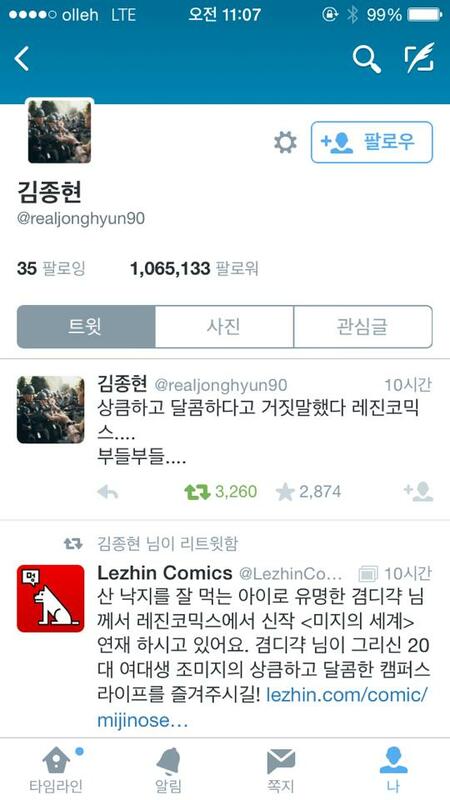 *The following screenshots are from SHINee Jonghyun’s official Twitter account, taken from Lezhin Comics KR Facebook page on Sept 22, 2014. Lezhin: Author Gyeomdigak, famous for <The Baby Who Could Eat Live Octopus> will be publishing <Miji’s World> at Lezhin Comics. Come enjoy refreshing and sweet campus life of university student Cho Miji as drawn by Gyeomdigak! JH: It’s a good read, to test your mental limits while hating yourself for being able to relate quite well. It’s not easy to make a recommendation….. I just like a lot of genres….. Unfortunately, <Miji’s World> is not yet available in English ;A; but Jonghyun is also known to be close with Neonbi, another famous author who published <Bad Boss> at Lezhin Comics in Korean, and author Kimbotong <D.P.-Dog Days>, also published at Lezhin Comics. Jonghyun actually sent a DM to Kimbotong, sending a screenshot of his My Library that had all the episodes of <D.P.-Dog Days> purchased, along with “I’ve been a fan for a quite some time~~ hee” message!